Has your smile been stuck in "Cosmetic Limbo?" Were you afraid your only other choice is to have braces for Two Years or longer? Have you considered Veneers but didn't want your teeth permanently altered? Were you quoted more than $7000 for braces? You would be surprised how much you could save. In the past, your only choices to correct a crooked smile were traditional comprehensive orthodontics or Porcelain Veneers. Today, you can have crooked, crowded, or spaced teeth straightened cosmetically with 6 Month Braces. Want to find out if Six Month Smiles is right for you? Six Month Smiles? "Rapid" Adult Braces offers an easy, affordable, and effective alternative to traditional orthodontics and porcelain veneers in many cases. These remarkable results are possible in about 6 months. What new career opportunities await you and your new smile? How would your social life change with your new smile? Think about it - In the time it takes between your regular cleaning appointments, your treatment can be complete! In just 6 Months, you can enjoy your newfound confidence with your own "Cumberland Dental Smile." You don't have to feel embarrassed about your smile anymore. You can go "From Zero to Straight in Six Months!" If you would prefer the service of an office geared towards Adult Orthodontic Treatment, offering a private atmosphere, we believe you'll feel right at home at Cumberland Dental. Free Straight Teeth Consultation available until June 21st! What do patients have to say about Six Month Smiles? Click on these VIDEOS and find out. A: Dr. Gaffey utilizes the latest techniques and technology to move your teeth quickly and safely. It's important to note that Six Month Smiles Adult Braces are not intended to be a substitute for comprehensive orthodontic treatment. 6 Month Braces are intended to straighten the teeth that show in your smile. This approach may not address bite discrepancies. Six Month Smiles is a technique aimed at treating the cosmetic zone in ADULT smiles. 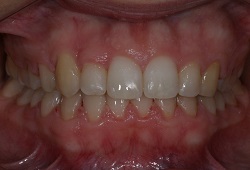 Some complex cases may need more comprehensive orthodontic treatment and can take longer. Its important to select the right type of treatment at the beginning to get the best outcome. Jack can assess your case and discuss the time required for your individual case with you. Q: How do 6 Month Braces compare to "Invisible Braces" that I've seen advertised on TV that use clear plastic trays? 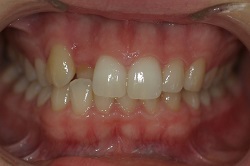 A: "Invisible plastic braces" uses a series of clear hard plastic trays to move the teeth. 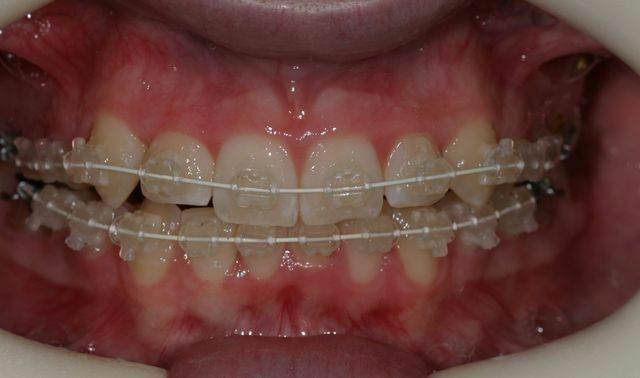 6 Month Braces uses nearly invisible brackets and wires. So, while 6 Month Braces are a bit more visible, they work MUCH faster and give Dr. Gaffey far more control over the results. Also, 6 Month Braces don't require you to remember to do anything. The "Invisible braces" on TV require you to constantly put a series of trays in (and then take them out for eating). 6 Month Braces are on "auto-pilot." All you have to do is see Dr. Gaffey once a month for about 6 months. Q: How will I look with these braces? 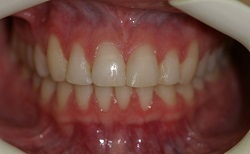 A: 6 Month Braces are virtually invisible. Dr. Gaffey uses tooth-colored brackets. Even the wires are white. Q: Does the 6 Month Braces Technique damage the teeth, roots, or gums in any way? I've heard that moving teeth can cause root damage. A: The Six Month Smiles? 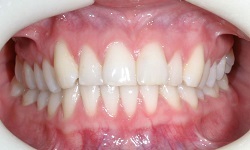 The technique uses light force with short treatment duration to safely move the teeth. There is no evidence that root damage or "resorption" is any more likely than with traditional braces, which is VERY rare. Q: Do 6 Month Braces cost more than regular braces? A: 6 Month Braces may be a bit less expensive than traditional braces. A: Yes, as with any orthodontic procedure a retainer is necessary. This is especially true for adult orthodontic treatment. For convenience, we recommend a permanent, bonded retainer be used. This way you don't even have to think about it, and nobody can see it. Q: Are 6 Month Braces more painful than regular braces? A: No. The Six Month Smiles Technique uses LIGHT force to move the teeth gently and comfortably. Like with traditional dental braces, some patients may experience some temporary discomfort. For those occasions Panadol or Nurofen work well. However, most patients tell us they just feel a "tightness." Q: Why not just get veneers done instead? A: Dr Gaffey says, "While veneers can provide great results, 6 Month Braces offer a more conservative and far less expensive solution to a crooked smile. Veneers are a wonderful way to improve the shape and color of teeth and continue to be an excellent choice for some cases. However, 6 Month Braces, along with Tooth Whitening, provide beautiful results without having to make irreversible changes to your natural teeth. Call us today for a consultation, and we can discuss which is best for you." Payment Plans Available from $41 per week.